Get the benefits of meditation without meditating & experience deeper mind states in minutes. Over the eons, shamans have passed down an ancient meditative-type practice that has stood the test of time. Thousands of people worldwide have practiced shamanic journeying to accelerate their mental, emotional and spiritual growth. You can too. The shamanic journey takes you into a deep meditative state where you experience predominant slower brain wave states --theta and delta brain wave frequency states. 1. Unlike typical meditations, journeying is not an end result, but rather a bridge to higher levels of consciousness. Shamans believe it’s not enough to just reach a deep meditative state, we need to cross that bridge and be active participants while we are in deeper mind states. Shamanic journeys fulfill a purpose. Before you start a journey, you focus on a specific question or issue that you want insights on or help with. The purpose of a journey is to get insights about your personal life. 2. Journeying is also different from “meditation” because it does not need to be a sedentary practice. You can learn how to enter a deeper mind state while you walk and even when you're in a noisy environment. Though the main purpose of journeying is to gain insights, answers and help about your life, you ALSO gain many physical and emotional benefits at the same time! How would your life change if you felt more peaceful & happier? People who do regular meditative practices tend to be more peaceful and more optimistic than those who do not. Not only that, they tend to have less fears, anxiety, frustration and sadness. Why? In slower brain wave states, such as theta, the body and mind release heavy emotions such as anxiety. Developing inner calm positively helps us to more easily manage the ups and downs of daily life. Did you know that people who do meditative-type practices create pleasure brain chemicals—the ones that make you feel happy? Do you think you could benefit if your mental abilities grew? People who regularly practice some form of deep meditative practice also tend to benefit from increased creativity, problem-solving abilities, greater mental clarity and concentration abilities. What if you could improve your health & delay the aging process naturally? Above all, by quieting the mind and experiencing theta and delta brain wave frequency states, we also strengthen our spiritual connection. Our minds are our link to Spirit. Here's a quick overview of the brain wave states. The mind can be described by levels of brain frequency. Every second of your life, nerve cells in your brain generate electrical patterns that change depending on your state of mind—your thoughts and emotions. Scientists refer to these electrical frequencies as brain wave patterns. .As our mind quiets down–or slows down, it starts to produce slower brain wave activity, such as Alpha and Theta. When your brain wave activity slows down, you access capabilities of the mind that you normally don’t use. Our brains typically have all the brain wave patterns happening simultaneously, with one of the brain wave frequencies being dominant at any given time. In Beta, the brain frequency is between 14-21 pulsations per second. People spend most of their waking life in Beta. This mind state is associated with constant mind chatter. Have you ever tried to quiet your mind but found that it was impossible to stop thoughts from zooming in from every direction? Or, maybe you’ve had the experience of not being able to remember an answer when you felt tense? That was Beta. Research has shown that this state is associated with stress-related symptoms such as anxiety, poor sleep and depression. When we’re in Beta, we’re at our poorest potential for learning and healing. Also, our ability to reach creative solutions and breakthroughs is at its weakest in this state. Given the research, it should be no surprise that if you spend all your waking hours in Beta, you’ll be at a great disadvantage. Your ability to create the life you desire is weakened. In Alpha, your brain frequency slows down to 7-14 pulsations per second — about half that of Beta. Alpha is often experienced when we are in a very relaxed state. In states of Alpha, you have a greater potential for creative breakthroughs, insights, and learning. What takes years to learn in Beta, for example, can take just months in Alpha. People most commonly experience Alpha when they are close to falling asleep and during meditative type practices. You can also access an Alpha state while spending time alone in nature. In Theta, your brainwaves slow down further to 4-7 cycles per second. People can experience Theta during meditative-type practice or even during fasting. Also, you can access this powerful state while being in nature, such as a forest or desert, for extended periods of time. In Theta, the mind is more open to suggestion. This means you can be more effective in creating the results you want in your life. Theta is associated with enhanced creativity, intuitive abilities, mental clarity and increased abilities to concentrate. Here, you can learn things that you never thought were possible. The scientific results are fascinating. Dr. Thomas Budzynski, a researcher in the field of neuroscience has reported that self-defeating filters of the “left brain” are bypassed in Theta, and that people can more easily make positive changes in beliefs or habits. Dr. Elmer Green, a biofeedback pioneer, has reported increased mental clarity, intelligence, and intuition as well as positive changes in mental and emotional health during deeper mind states, such as Theta. In Theta, the brain also produces more levels of many beneficial brain chemicals, such as pleasure-causing endorphins. What’s the result of that? Stress melts away, aging slows down and you gain a sense of total well-being. In Delta, the brain frequency is between 1/2 to 4 pulsations per second. When your mind slows down even further, you enter Delta, a state that is extremely powerful. 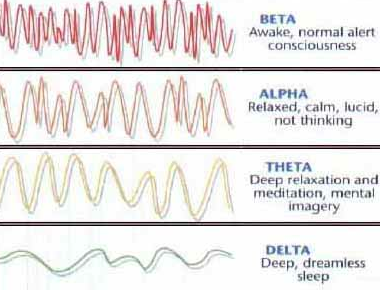 Few people can consciously use this mind state because when most people enter Delta, they fall asleep. At the Delta level, the body releases anti-aging hormones, such as human growth hormone (HGH), and boosts the immune system. As we get older, we produce less HGH, which results in many aging symptoms including loss of stamina, sagging skin, reduced memory and diseases associated with aging. We can delay the aging process when we use our minds in a certain way. What shamans teach about deeper mind states is astounding. Delta is a powerful mind state available to all but few have been able to consciously tap into it. For eons, shamans, mystics and sages have known of the powers of deeper mind states—long before scientists discovered mind training. Certain Native American wise elders, such as Sitting Bull, and Apache scouts, such as Geronimo, used deeper mind states for miraculous healings, to communicate with plants and time travel. You might think it sounds like science-fiction but our minds are far more powerful that most of us can imagine. I would say it largely comes down to lack of awareness…simply not knowing the choices that are available. In our busy society, we're not taught how to use our mind powers. Many people have the false belief that the only way to experience the benefits of meditation is to actually “meditate.” A common misconception is that you need to sit in a certain position and repeat a mantra to experience higher mind states. Again, the main purpose of journeying is to gain insights, answers and help about your life, but journeying provides other benefits too. You ALSO gain many physical and emotional benefits at the same time. Experience it for yourself today. You can immediately download my step-by-step guided audio that walks you thru the entire process by clicking on the button below. AND, when you order The Journey, you’ll receive a bonus gift to help you get the most out of your journeys! *how your negative thoughts can be eliminated by using your other mind (we have two minds!). The Journey & Bonus Gift. Click on the button below to get the MP3 version. Some people report gaining amazing insights the first time they do a shamanic journey. Everyone, at a minimum, experiences deep states of mind and body relaxation right away. The reason for quick results is that you don’t have to learn any complex process. The audio guides you thru step-by-step. In the first half of the audio, you’ll be guided to deeply relax your body and mind. We suggest that in the beginning that you practice the full journey each day, which is nearly 40 minutes. Then, later when you’ve practiced enough and can journey without the audio, you can do the shorter version when you want. Are there any drawbacks to being in deeper meditative states? You need to be careful with your thoughts because in deeper mind states, your mind is more receptive to ideas that you focus on. That means you need to be very vigilant as to what you focus on when you’re in deep meditative states. Since the filters of your Beta mind are bypassed in meditative-states, what you focus on expands. So it’s especially important that you focus on thoughts that lift your spirit. Did you know that when you watch movies, television programs or listen to certain types of music, your mind enters Alpha? That’s why television and movies can be so effective in influencing people’s behavior on a mass level. Think twice before you watch violent and fear-based movies and news! Always be aware about what you focus on—especially when you’re in deeper mind states. May you expand your awareness on your journey. P.S. Please write me at services@unlimitedinnerpower.com to share your journeying experiences.